Today was a good day. It started with being able to sleep last night. Getting up there were no signs of dizziness, nausea or excess pain in my shoulder and hips. After Breakfast I went with Dean across the Antioch Bridge onto Sherman Island via Highway 160. We turned of the main road onto W. Sherman Island Rd to go towards the end to see the Windsurfers. 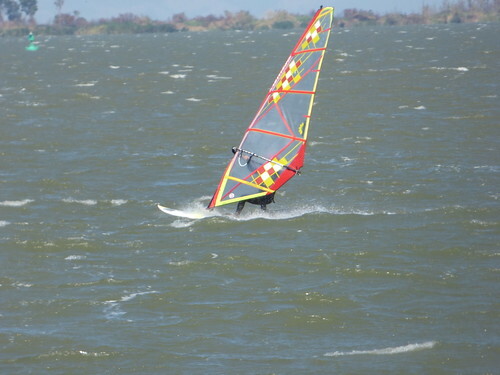 Being a week day there were not to many windsurfers, but enough to take some pictures. In addition to the windsurfers we also saw some cows grazing. Last but not least there were also the windmills that one can not over look. After returning back to the mainland we went to the Dow wetland for our daily walk. After the walk we did some shopping at CostCo. We got home just in time for lunch. After resting for a bit and watching some World Cup soccer Dianne came home. Dianne and I went for a walk before getting dinner ready. Again there is not much more to write about. After dinner we continued to watch a movie and some TV. That it for today, in summary, today was overall another good day.